Any hopes of Pokello and Selly reconciling as friends were shattered into a million pieces this evening. Today Pokello revealed during her Nomination Diary session that her relationship with HoH Selly is at a tipping point. The Zimbabwean claims that Selly is trying to wind her up to get a reaction out of her. “I now believe that incident of her pouring her cranberry vodka on me was with malicious intent,” she shared with Biggie. Pokello also made claims that Selly and Elikem gossip about some of the other Housemates in their home language and said that this is something that has been a source of great tension among the three of them. “I am sick and tired of it,” she snarled. Biggie wanted to know from the Ruby lady, who was visibly in very low spirits, just how she is dealing with all of this tension. “I have been sleeping, that is how I choose to handle things,” she revealed. Do you think that Pokello is right about Selly? Is Selly really trying to stir up trouble or is the Zimbabwean just being paranoid? 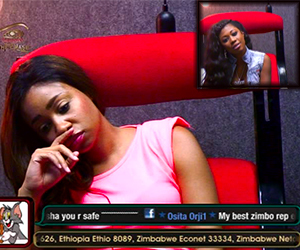 selly is trying to cause trouble, thats why she brought fatima and feza in th ruby house. this is just a game and selly is only playing the game.